If you’ve followed Design Improvised long enough, you know that I live for the holidays… all of them! In fact I have a whole page filled with crafts for each holiday throughout the year. 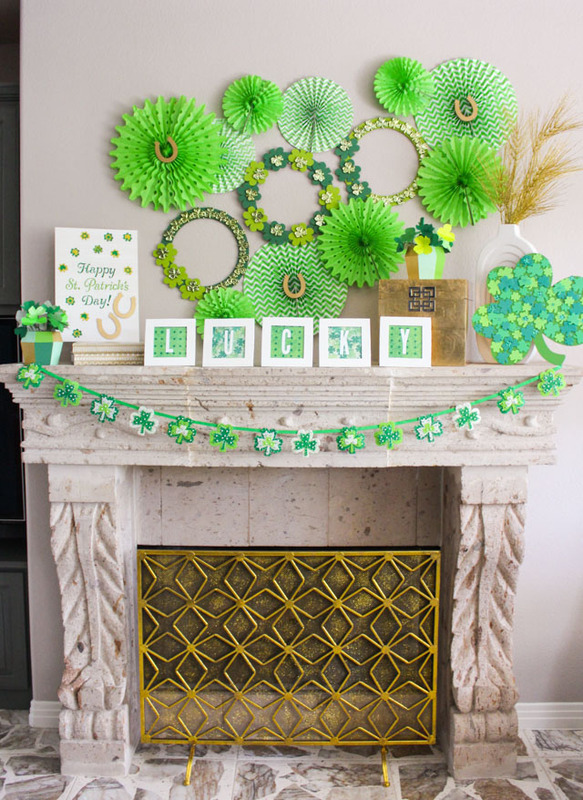 Even for holidays like St. Patrick’s Day I like to put up a few small decorations, and sometimes I like to go all out, like I did with this shamrock-filled mantel I made in partnership with Oriental Trading Fun365.com! The funny thing about this mantel is that I created it last October. Yep, we often celebrate holidays at very strange times in this house. It’s all part of the job of being a craft blogger, and I love it! I just have to remember to bring the decorations back out when the actual holiday comes around. 😉 We love having friends over for a traditional corned beef and cabbage dinner, so I’ll be using some of this decor to decorate! By the way, this fireplace screen from Hayneedle.com has made such an impact in our family room. It eliminates the dark hole created by the fireplace and looks so great along with gold accents on top of the mantel. I highly recommend a screen if you have a fireplace at home! 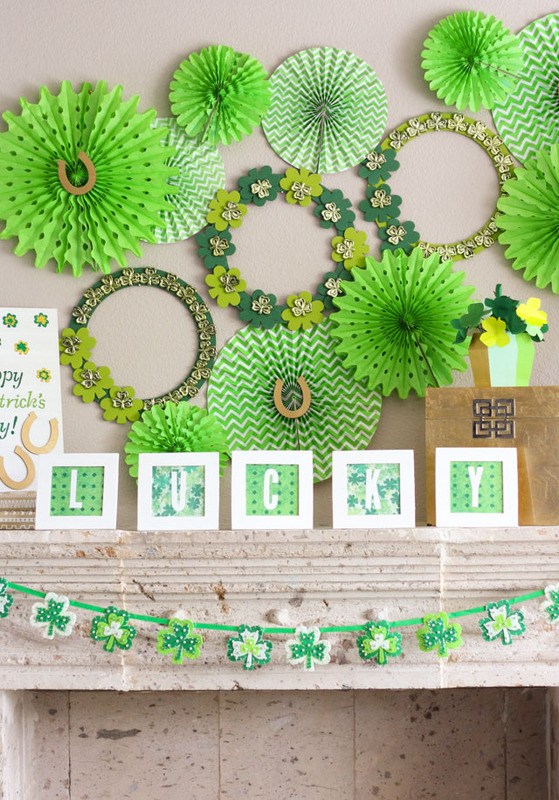 My favorite part of the mantel was the modern wood shamrock wreaths I made to incorporate along with the paper party fans. I also made a simple wood slat “Happy St. Patrick’s Day” sign which would be the perfect festive touch if you don’t want to do a ton of decorating. 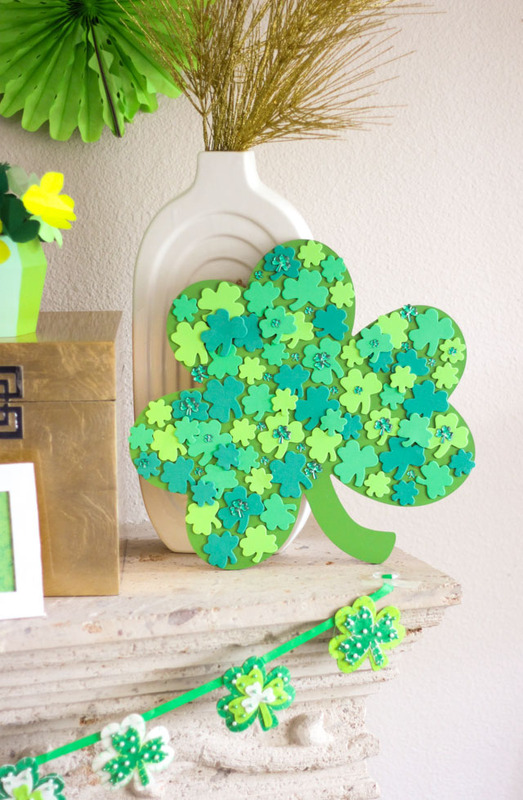 Head to Oriental Trading’s Fun365.com blog for the all of the St. Patrick’s Day Mantel tutorials and full list of supplies! This post is sponsored by Oriental Trading.